Riders struggle up Canton Avenue in Beechview during Saturday's Dirty Dozen cycling competition. Riders head north on Washington Boulevard at the start of the race. Riders wait at the top of Suffolk Street in Fineview. 16-year-old Ian Baun heads up Suffolk Street in Fineview. Baun finished 2nd overall. The third hill was Logan Street in Millvale. Joe Bonadio lives on Canton Avenue. Every year, he trims the weeds and sweeps the road before the Dirty Dozen riders arrive. Riders pedal along Welsh Way on the South Side during the Dirty Dozen. When Danny Chew does something, he does it all the way. The cyclist's goal is to ride a million miles over the course of his lifetime. The 51-year-old Pittsburgh native has won the Race Across America twice, riding 3,000 miles in eight days on three hours of sleep each night. So it’s only natural he’s the guy responsible for what many consider to be the most grueling bike race in Pittsburgh: the Dirty Dozen. The event challenges cyclists to ride the steepest hills in the city. Those hills are incorporated into a 50-mile loop that begins in Highland Park and ends in Hazelwood. Riders took to those hills on Saturday for the 31st annual Dirty Dozen. The competition originated in 1983, when Chew and his brother Tom and friend Bob Gottlieb got together and pored over topographical maps of Pittsburgh, looking for the places where the lines that represent the change in elevation were closest together. That first year, only five people raced, including the three organizers. And they were the only ones to actually finish. “It took a long time to grow,” Chew said. “By the 15th year, I was still only getting about 20 people. It was only in the last 10 years that I started getting up to 100 riders, and then over 2-300 in the last few years." At 10 a.m. Saturday, the temperature was still below freezing, and the crowd was a sea of spandex in highly visible yellow, green and orange. More than 250 people gathered at Washington Boulevard Bike Oval in Highland Park, gearing up to head across the Highland Park Bridge to Guyasuta Road in Aspinwall. Among them was 33-year-old Stephen Cummings, Pittsburgh real estate agent and nine-time Dirty Dozen champion. The winner is chosen through a point system, and Cummings said he’s never actually had to race the last hill. At the bottom of each hill, Chew blew his whistle, and the race was on. The first person to the top gets 10 points, the second person gets nine, the third gets eight, and so on, for the top 10 places. The ride between hills isn't competitive. Every year he’s raced, Cummings has had a mathematical lock on first place after the 12th hill. But he said the competition is getting tougher every year. Cummings said the seventh hill, Suffolk Street in Fineview, is the most difficult. "You’ve got relatives and friends yelling, ‘Go, go!’ Somebody’s ringing a cowbell, like a rooting section. Riders are falling left and right, people are trying to get by the person that crashed in front of them. It’s really a spectacle." Predictably, Danny Chew says Suffolk is his favorite hill because it has the longest sustained steep section. 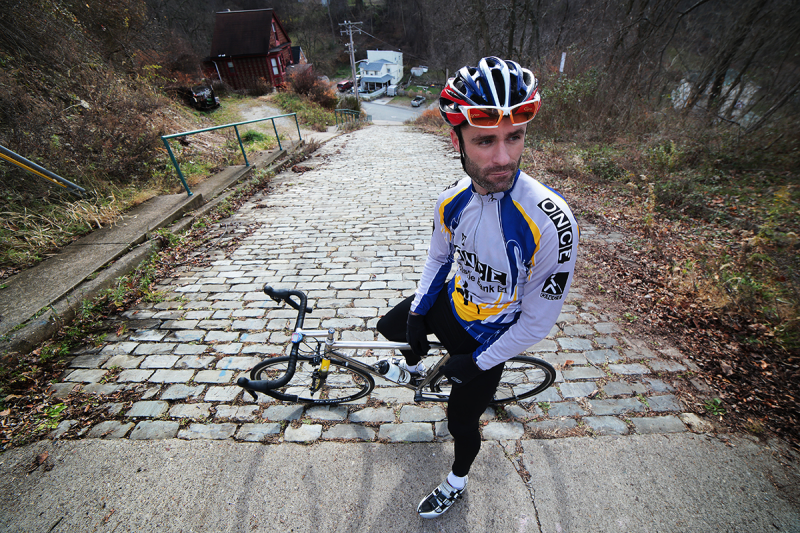 Suffolk may be the most difficult climb, but the most infamous hill in the Dirty Dozen is Canton Avenue in Beechview. With a 37 percent grade — meaning there is 37 feet of rise for every 100 feet of distance — Canton is the steepest paved street in Pittsburgh and is considered one of the steepest in the world. “It’s really a circus event,” Chew said. “You’ve got relatives and friends yelling, ‘Go, go!’ Somebody’s ringing a cowbell, like a rooting section. Riders are falling left and right. People are trying to get by the person that crashed in front of them. It’s really a spectacle." There to cheer on the riders Saturday were father and daughter Rich and Jill Betters. Rich lives south of Pittsburgh, and Jill lives in Philadelphia. The two had been watching the live stream of this year’s race on the website CyclingFusion.com and knew they couldn’t miss seeing Canton in person. “We actually kind of planned our day around being here today,” Jill said. If a cyclist loses forward motion, stops or puts their foot down, they have to start the hill over from the bottom. “It’s so short that it doesn’t take a whole lot of energy to keep trying again, so there’s this constant parade of riders up there,” Chew said. “I made the food stop on top of Canton Avenue, 'cuz we’re there for at least a half hour while all these people try to get up the hill." Ryanne Palermo took three tries to get to the top of Canton. On the third try, catastrophe struck. “Last time I came up, had a good line on the right, but then got to the very top and tried to shift a gear and my rear derailleur just ripped right off the bike,” she said, referring to the mechanism that switches gears on the bike. With cyclists re-riding hills, two food stops and a group photo on top of Mt. Washington, the entire race takes seven hours to complete. After Canton Avenue, there are just four more hills for the cyclists to tackle. As if the race wasn’t hard enough already, Chew throws in one little twist right at the end. Unlike previous years, Stephen Cummings actually had to race the last hill. There is only one other racer with enough points to catch him: 16-year old Ian Baun. “He’s a good kid, if he beats me, that’s good for the sport, and for Pittsburgh cycling,” Cummings said at the top of Eleanor Street, the second-to-last hill. It took about 25 volunteers to keep the race running smoothly. There were people who are in charge of the food stops at Millvale Park and the top of Canton Avenue. There were two people keeping track of the top finishers in the men’s and women’s categories, and there was a whole crew of folks live streaming the event. Then there are the sponsors, one of which is well-known for associating its brand with extreme sporting events. Eat’n Park provided snacks and warm drinks at the food stops. Mini of Pittsburgh lent the videographers cars so they could squeeze into small parking spots, and Big Bang Bike helped with mid-race bike repairs. It’s unusual for a bike race to have so many participants and sponsors and to not be sanctioned in any way by the competitive bicycle racing community, by the city, or even by the police department. “(The police) know that I have it and don’t bother me at all,” Chew said. “Hopefully that’ll continue that way, but as it gets bigger, obviously it’s going to be harder for me to keep doing it." It’ll also get harder for Chew to keep doing it as he gets older, but he doesn’t see that becoming an issue any time soon. Ryanne Palermo, who lost her rear derailleur at the top of Canton, was able to borrow a bike from her cousin and ended up winning the women’s competition. Stephen Cummings walked away with his 10th win, after Ian Baun got a cramp on the 12th hill. Whatever Cummings decides next year, there will be hundreds of riders nipping at his heels. With more than 250 cyclists, this year’s group was the second largest ever. One of Pittsburgh’s most popular bicycling events turns 30 years old this Saturday. 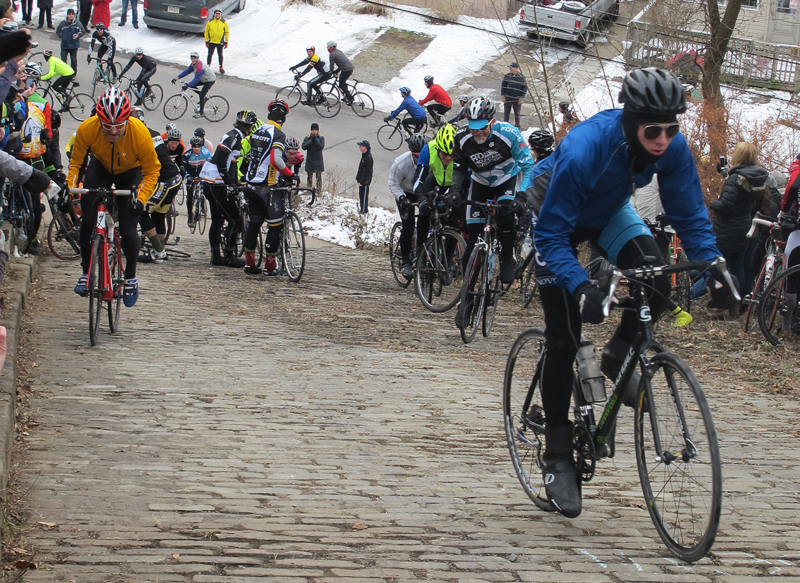 The Dirty Dozen bike race challenges cyclists to climb the 13 steepest hills in the city. The 50-mile route takes riders from Highland Park, through the North Hills and the North side, across the Roberto Clemente and Smithfield Street bridges, through the South Hills and the South Side, ending in Hazelwood.